Every successful sports franchise has a group of players who take a backseat to their famous superstar teammates. These unsung players put in 110% every time, consistently producing results, the team would be a fraction of itself without them. This metaphor also rings true in the aquatic world. Certain prey items such as mayflies or chironomids always seem to garner the limelight. Seasoned anglers soon realize that a journeyman approach to imitation produces all season as well. 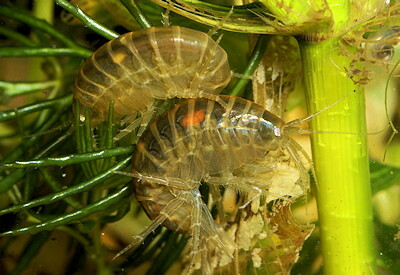 Scuds or freshwater shrimp, to some, are a perfect example, a true journeyman of the underwater world. Widespread, scuds are prevalent in lakes, ponds and running water environments such as spring creeks and tailwaters. Despite their Rodney Dangerfield reputation these crustaceans deserve attention. Constantly active, scuds are a calorie rich food source that are most available during low light hours, early spring, fall and when focused hatches aren’t distracting trout. Trout have few qualms consuming huge quantities of this important freshwater crustacean. On productive stillwaters, scuds can be the most important food item on a year round basis. This is especially true during the long cold winter months as scuds are a dominant prey when trout decide to stir and feed. A key catalyst for proportional expansion, a healthy diet of scuds produce leviathan trout in short order. Growth rates in excess of 2 pounds per season are commonplace on scud rich waters. Scuds belong to the order Amphipoda and share common crustacean roots with lobsters, crayfish and shrimp. Within the Amphipoda order are two families of scuds of interest to fly fishers, Gammaride (Gammarus) and their smaller more widespread Taletraide (Hyallela) cousins. 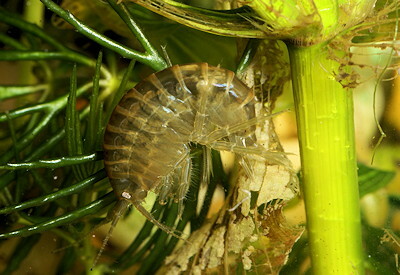 Gammarus require high concentrations of calcium and occupy a narrower range of waters. Hyallela on the other hand are hardier, capable of surviving in alkaline and acidic waters. For the fly fisher the only distinguishing feature of importance between these families is size. 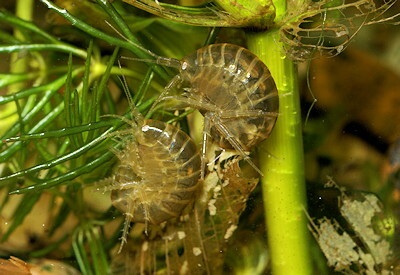 Gammarus are the larger of the two attaining sizes of 25mm (5/8") while the diminutive Hyallela seldom exceeds 5 mm (1/8") in length. Granted, both species are easily confused depending upon growth and development, within each family males are the largest. From a fly perspective hook sizes ranging from #18 through #10 covers both families, size 12 is a recommended starting point. Featuring a chitenous back of overlapping plates scuds resemble miniature armadillo’s. Many anglers capturing or viewing a stationary scud for the first time may consider using a distinct curved hook to imitate their natural profile. This would be a mistake. Fly fishers need to imitate moving scuds darting through the water in an outstretched manner. Only their tail area or telsun hangs down. Curved scuds are dead, resting or feeding. Pronounced curved pattern profiles should be avoided. Successful hook styles include standard shank or a scud pupa to suggest mobile scuds. The kind foraging trout are hunting. At the vise fly fishers should consider the effect of weighting patterns. Curved pupa hooks tend to roll upside down when weighted as the crest of the shank is now the heaviest point. A phenomenon christened the keel effect. Successful scud patterns feature scruffy undersides of dubbing, a pinch of soft hackle or similar materials to suggest the 7 pairs of legs that always seem to be in a constant state of motion. A traditional Hare’s Ear Nymph tied in a spectrum of scud colors is an excellent imposter. The aquatic world is a rainbow of color and contrast and scuds are camouflage masters. Clear waters featuring marl and chara shoals are home to lighter pale olive or tan scuds while algae type waters with dark muddy bottoms, dense weedbeds and suspended particulate matter slant toward a rich dark olive. While not quite chameleons, scuds do however have the ability to match their surroundings over time. Through aquarium study I have observed scuds change gradually from olive to a translucent pale olive/tan as the weed growth subsided, mirroring the marl substrate in the tank. As part of their natural growth process scuds molt, shedding their skin. Immediately after molting the translucent exoskeleton has not hardened, allowing the scud to absorb water and stretch their new skin facilitating expansion. This translucent exoskeleton coupled with their copper based blood system creates a distinct blue hue. Make a habit of tucking away a few blue or blue/grey scuds to contend with trout focused on molting scuds. Orange scuds are another atypical color. Pregnant scuds often display an orange tint as a result of the eggs contained in an external pouch known as the marsupium. If trout are fixated on pregnant females a dubbing blend tinted with orange dubbing can be key. Gravid females also display a large bulge about 1/3 back from their head area, another indicator of a pregnant female. In the late fall and early spring scuds build up fat reserves also providing an orange touch to their coloration. Tailwater scuds often fall victim to fluctuating water levels, leaving them high and dry, left to perish. Deceased scuds, rich in carotene turn orange. As water levels rise marooned scuds are swept downstream into the paths of opportunistic trout. Orange scud patterns are a worthwhile addition to any tailwater fly box. Carotene also transfers to the flesh of any predator and is the cause of the orange flesh of scud stuffed trout. Anglers sampling the near shore shallows may also observe scuds with a focused orange spot in the middle of their backs. This orange spot is a unique parasite called Acanthocephalan. Scuds are an intermediate host of this bizarre parasite. Scuds ingest the parasite which matures and takes up residence in the body cavity. Once mature, the parasite affects the host in a number of ways including an attraction to light or altering the disturbance behavior, causing the scud to flee toward the surface away from trouble. Not a sane response when pursued by a ravenous trout. This behavior explains how trout become fixated on orange spot scuds, which anglers often confuse with select feeding on pregnant females. Scuds avoiding marauding trout are ultimately consumed by the final hosts such as ducks or grebes, completing Acanthocephalan’s life cycle. Scud patterns featuring a central orange spot of dubbing serve to suggest both infected and pregnant scuds. Preferring to inhabit shallow weedy areas, often less than 5 feet deep, scuds dart and crawl in a random and erratic manner amongst the benthic debris dining upon a variety of plant and animal matter. Favorite scud fodder includes aquatic invertebrates and periphyton, an algae species that attaches itself to plants and rocks. I have witnessed scuds attack damsel nymphs en masse in piranha like fashion, shredding the hapless nymph in seconds. As water temperatures warm to the low to mid 60’s mating occurs. Scuds couple up with the male piggybacking on top of the female. The female extrudes her eggs into the marsupium and the male externally fertilizes them. Once mating is complete the male disengages and separates from the female. 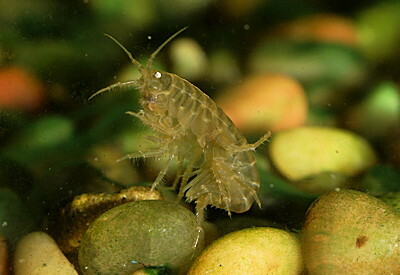 Gammarus are capable of 3 to 4 broods per year each consisting of about 50 eggs. Hyallela are similar in their mating behaviors and tend to produce higher brood rates than their Gammarus cousins. Scuds are light sensitive and tend to be most active when direct light is not on the water. Early morning, evening or under overcast or cloudy conditions is prime scud time. I recall moving my pram one morning to discover a seething mass of scuds that had taken refuge under the shade of the hull. On rivers and streams scuds take part in a phenomenon known as behavioral drift dispersing down stream. This trait peaks at dawn and dusk, once again a key time to consider drifting a scud pattern. Stillwater scuds are best imitated using either floating lines coupled with 15 foot or longer leaders or slow sinking intermediate lines. Employ a varied retrieve combining slow handtwists, short strips, and prolonged pauses to suggest the scud’s random ramblings. Vary the pace and length of the pull during the retrieve to determine what works best. Over deeper weedbeds and along drop offs faster sinking lines can be used. Keep in mind that the fly line should not overpower the retrieve. It is critical to keep the fly skipping above the weed tops for as long as possible. It is not a race to drag the fly down at a record rate. At times suspending the fly beneath an indicator can be lethal, particularly when are trout patrolling the shallows. Another tactic worth trying when trout are ferreting scuds out of the marl is allowing the fly line to sink into the bottom ooze and debris and then twitching the fly creating a tell tale puff. Trout are drawn instinctively to the fly and when casting to sighted fish this tactic is exhilarating to watch. On moving water scuds can be fished using traditional nymphing techniques or a combination of down and across drag free presentation and strips over slower moving water.